This month, the Region of Peel endorsed a comprehensive Food Charter, designed to lead a collective effort in achieving a just, equitable food system for the area and its residents. The Charter is a living document developed through significant input from the community, and comes as a response to the growing concern around food insecurity in the region and across the country. Peel’s Food Charter will act as a road map to guide the actions of its residents, community organizations, businesses and government in achieving a food secure community. 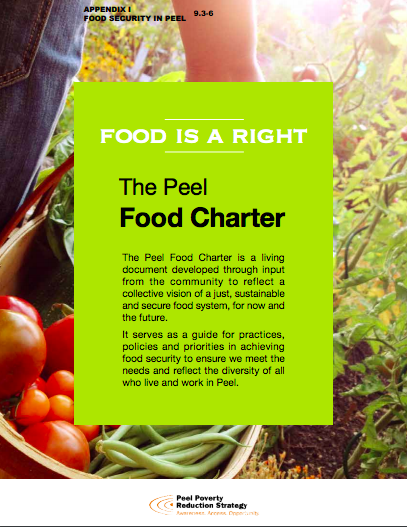 Development of the Charter first began in 2014 through public consultations, led by the Peel Food Security Taskforce. The Taskforce identified the development of a Food Charter for Peel as a priority, as well as the creation of a Peel Food Map — via an environmental scan of food programs in the area. The Peel Food Map, which illustrates there are more than 200 food programs and initiatives in Peel Region, will help identify vulnerable communities, service gaps, overlap of food programs, and refer clients to local food programs. The environmental scan revealed that 14% of Peel households experience marginal, moderate or severe food insecurity; that children make up 51% of visits to the Mississauga Food Bank agencies; and that the cost to feed a family of 4 per week in Peel has increased by 26% between 2009 to 2016. Acknowledging that individuals, groups, organizations and government all play important roles in achieving food security, the Charter provides suggested high level actions that can be taken to tackle these troubling trends head on. As governments and not-for-profit groups embark on action, results of those actions will be measured. Food security is a focus of the Peel Poverty Reduction Strategy, launched in 2012, which initiated the creation of the Food Security Taskforce. The Taskforce successfully received Regional Council’s endorsement of the Peel Food Charter on November 9th; you can read more and access the Peel Food Charter in the Regional Council’s Nov. 9 Council Agenda.